Yes, three quarter has passed us by *finger snapping*, and with September dividends recorded, I have my first nine months of dividends received and documented! I feel like a big first step has been taken on my journey settling into financial independence. It feels great. It’s the first year where some of the millennials are seeing the bear market since 2008 and I’ve learned a lot along the way. All in all, I feel this year was a great success as my first year of investing as dividend growth investor. I’m on my way! 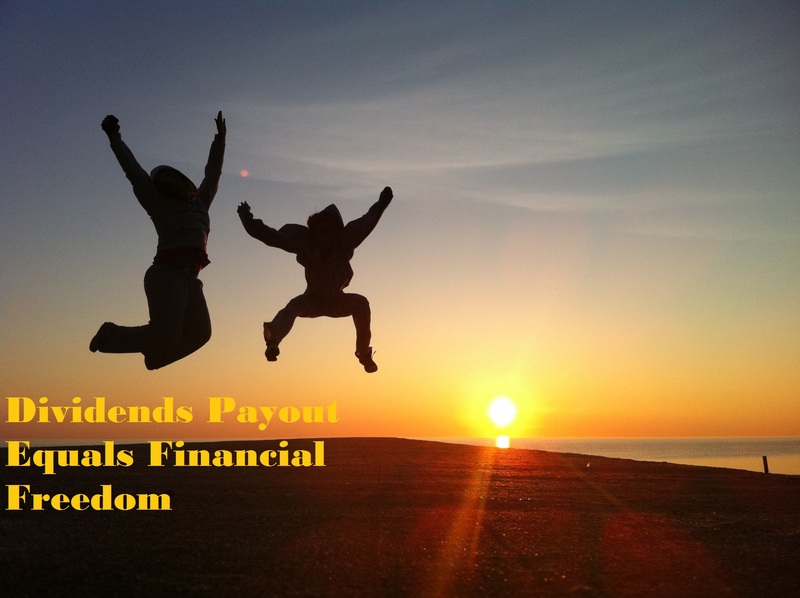 The dividend income I received for September break $500 again for the third time this year. I’m really excited. One day, I hope to look back on this month and see that this was the turning point. The point where I can start to see how passive income by way of dividends can replace my monthly expense. (As the majority of my FI income is from the rental business which is still semi-passive income.) I’m still a long way off, but September was a big success. This month is noticeably higher than the $577.63 in dividends I received in June 2015. That’s a 7.1% increase over the quarter. Considering the market has dropped by 10%, it hasn’t effect my dividend growth progress. That, right there, is great progress, and I hope I can keep up similar levels of success as I go! I was able to cover just over 24% of my expenses (check out how I kept my lifestyle from inflating) this past month through the power of dividends. It’s really great to know that I was able to cover a quarter of my monthly expenditures by way of complete passive income. The progress of dividend growth investing is real and tangible. The market can decide to mark up or mark down the value of a company day by day, but the dividends will still roll into my brokerage account just like usual. Dividends are reliable just like my expenses, and that’s one of the reasons I plan to use this strategy as my secondary income generator through early retirement. I either use dividend income to continue to reinvest to offset old age expenses or if one day I’m tired of managing property, dividend income will serve as my main source of income. It’s funny when my income is now come from 13 businesses rather than just relying on one company (my job). My job which there is always a risk of getting fired or layoff at anytime, but with pay checks coming form13 different sources, even if I don’t receive pay from 1 or 2, I’m still largely unaffected. That’s the beauty of dividend investing strategy. With the third quarter of 2015 behind us, I’m now nine full months into one of my goals to generate $3,000 in dividends during the year. The year is 75% over and I am 80% on my way to completing my primary goal. I’m a little ahead. If I December into the calculation, October and November will be bonus. I’ve now received a total of $2401.11 in dividends for the year of 2015. 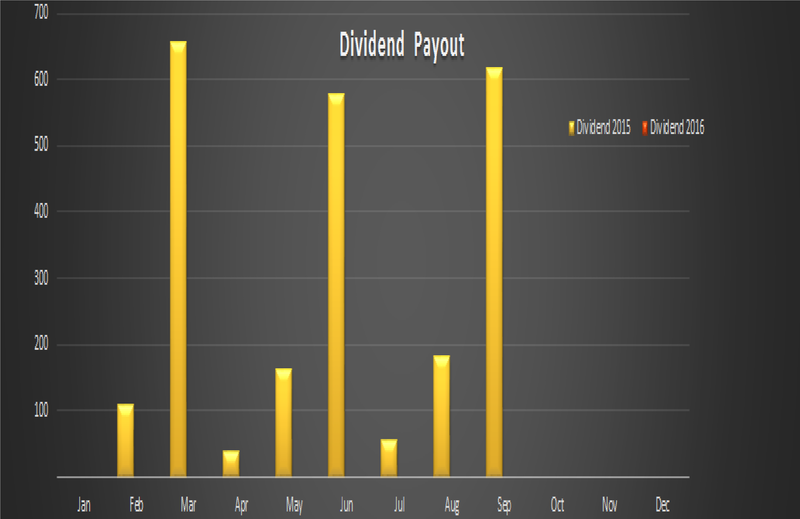 I’ll update my dividend income page to reflect September dividends. How are your dividend tallies progressing? Everything progressing the way you had planned? Wow! Congrats on the dividend income!! You are doing fantastic and growing your dividend well quarter over quarter. Thanks, R2R. I can’t wait to see your monthly dividend income report. I see that you’ve steadily and consistently been adding a few to your portfolio. The last three months of this year will set the trend for next year. Well done Vivianne, you’re making great progress. Thank you for visiting and commenting. I hope the streak will continue. Wow. You didn’t break $500, you broke $600! Great results for the month. No doubt a lot of those recent buys in the last three months are contributing nicely to your dividend return. Looks like you’ll easily get to your goal for 2015 with a full quarter to go. Keep it up! Thanks, Keith! This month and the next I’ll be busy with soccer coaching, full time job, and a side rental business. I don’t know how much I can follow stock. I’m looking forward to your future posts and analysis. Hey Vivianne, $600 pm in dividends is serious money, especially so since the dividend income stream is your secondary income stream. My target this year is to reach an average of $500 per month in dividends and I know how hard it. Kudos! * Can you please share the rate of return on your dividend stream? As you know, I invest only in mutual funds and I am curious to compare the rate of return with your style of investing. * I see that a majority of your dividends come from only two companies (BAC and WFC). This (imo) is very low risk diversification. I.e. you may want to spread the dividend stream across more than two companies for better risk diversification. I divide my stock holding into several categories – dividend growth, high yield dividend and growth stock. BAC is consider dividend growth stock. It accounts for 1/2 of my portfolio among LL, I’m about to buy Twitter, etc. If take out BAC my yield is 3.5%. If BAC is included my yield is 2%. If I stop investing today. My yearly dividend income is $4097. I won’t get $4097 this year as I bought these high yield on the 2nd half of the year. Your are absolutely right about diversification. My 401K contains S&P 500, housing, European blue chips, and banking. I feel it is diversified enough. As far as putting all the eggs in 1 basket: This year I like financial stocks. I bought JPM, BAC, V, even GE is a financial business among other businesses, COF, PYPL. I also have a mini Canadian Banks ETFs CM, RY, BMO, TD and BNS. The rate has to increase. It will not be like the 80s where the rate go up to 17%, but it should probably come up to 3% at some point, so the standard mortgage rate 5-7%. Banks are making a lot of profit right now, and they are sitting on a boatload of cash. If there is a nuclear war going on, the SEC, the FED, the everything have been making bank going through these strenuous stress test. They will survive. Crossing the $600 mark in a single month is impressive. Nice work Vivianne. Awesome Job Vivianne. You’re doing awesome. Nice gig complimenting your rental business. Dividends are wonderful and super passive. I love it. Thanks for sharing your journey and glad to have found you. Keep it up! Slowly and surely, we’ll crush all our goals. No doubt about it. Ez Pz. Take care and Cheers to our success! Thank you for commenting. I’m glad I found your website. I’ve just added you to the blogroll so I can see “how the rich people do it!” ha! It’s been great! It took me a long time to be convinced that dividend investing is the better way to go about reading FI. Best of luck to you too, bro! Great month Vivianne. You stumbled on why I love investing in these companies that have a track record of paying a strong and growing dividend. When the market gets tough and market value’s decrease, the dividend is there and you allows you to re-invest at a lower price and pick up more shares. I actually root for a downturn during March, June, September, and December since they are my heaviest dividend months! Keep up the great work and amazing progress! Solid numbers for your first 9 months of DGI! It’s already good but it’s just going to get even better once compounding really starts to take effect and you have multiple dividend increases behind you for each company. Keep up the good work!